I have mentioned here before what a treasure family photos are to me. I was surprised and thrilled when I received a comment in this blog from another Crittenden relative that I did not know about. 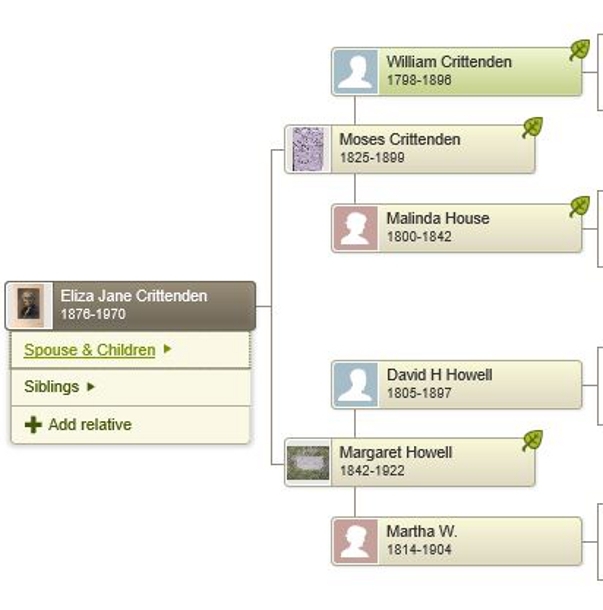 Our connection is through Moses Crittenden and his relationship with Emily Crittenden Weaver. The biggest thrill was that she had photos to share! She was very generous in immediately sending me scans of her photos and her best guesses as to who they are. Some are scans of photos that were taken of original photographs in a photo album. 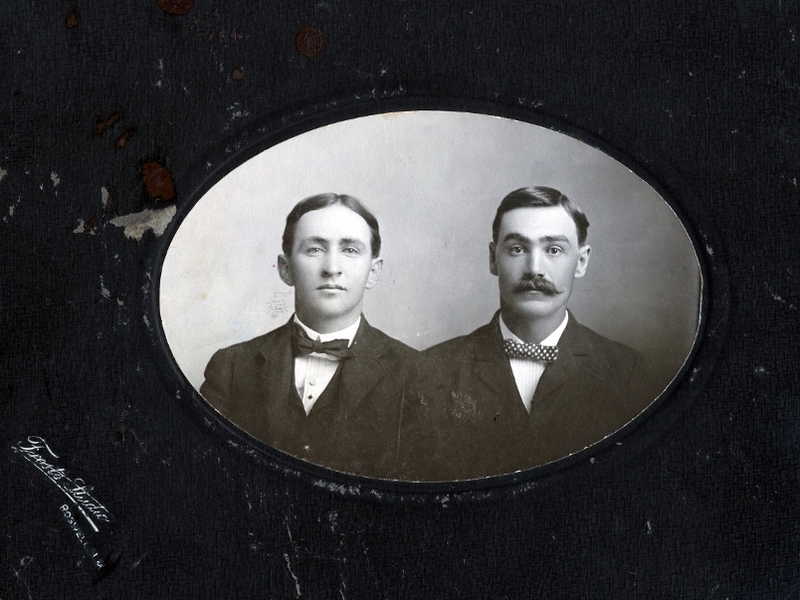 There are also some scans of treasured original tin types. I am going to attach the scans in this post with our combined best info about who is actually in the photos. I am hoping that someone who reads this will be able to provide more information and/or add to our growing collection of photos. Photos of Charlotte and Lottie Robbins. Daughters of Emily Crittenden Weaver. Anyone have any other photos of Charlotte and Lottie? Although this is identified as Emily, based on another photo that I have of her, I do not think that this is Emily Crittenden Weaver. Here are some thoughts as to who the people in these photos might be. More photos with needing identifying. Top row left – Emily Crittenden Weaver possibly – I do not think so. Top row right – I have had this photo identified by two people as Emily Crittenden Weaver. If so, then I do not see the resemblance to the photo above, next to Joe Weaver, identified as Emily Weaver. I was told that might be Emily, but she looks nothing like the woman top row, right, in this photo. Bottom row left – Possibly David Crittenden’s sister who was blinded when she was young. Hoping this is read by someone who can help us shed more light on these treasured photos, or add some photos of their own of anyone connected to Moses Crittenden and his descendants. New Post coming by February 9! The holidays, family illness and life in general came together to mean I have not posted on the site in a month. 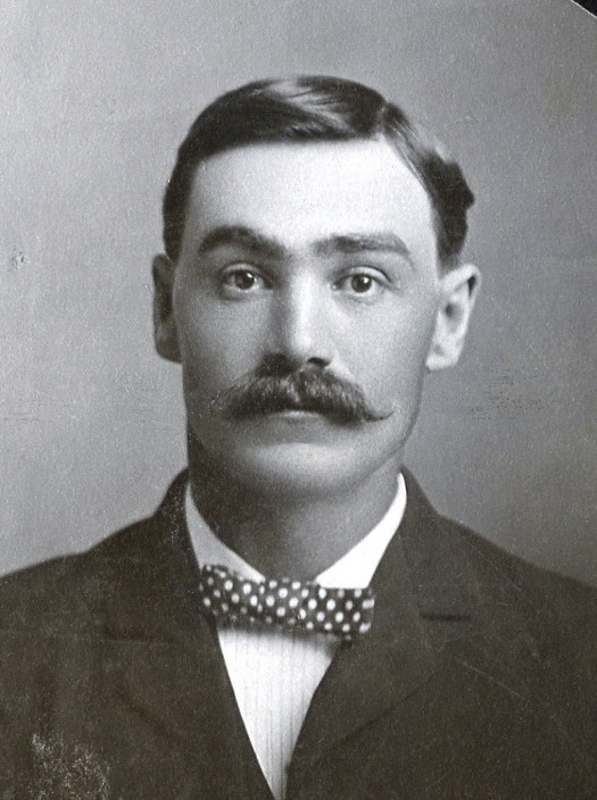 Coming next week are two new posts on following my great grandfather’s story in Arkansas where he resided for almost 30 years after leaving Georgia as a young boy with his father. My research trip in November opened up a wealth of information and records that I did not know existed. The Cherokee Emigration Records 1829-1835 were among the most valued finds on my family research trip to Oklahoma and Arkansas last month. For those of us whose Cherokee ancestors were early settlers who migrated to Arkansas before 1835 it contains a wealth of information. To have some understanding of what the emigration records represent it is necessary to have some understanding of the 1828 Treaty with the Cherokee. “Article 2…seven million acres of land in Arkansas…and a free and unmolested use of all the Country lying West..
As we all know, those U.S. promises meant nothing in the long run. The government did fulfill a portion of the provisions laid out in Article 4. This brings us to the Cherokee Emigration Records 1829-1835. This document contains the names and property valuations of Cherokees who emigrated under the 1828 Treaty between 1829 and 1835. I will use my great, great grandfather William Crittenden as an example of some of the information that can be found in these records. One of the most important pieces of information for me is a better idea of when William moved from Georgia to Arkansas. I knew that as an early settler he had come sometime before 1837. While the emigration records do not give me an exact date of his emigration, they do tell me the date that the valuation of his property was made, February 18, 1832. The valuations were made after the people listed had already moved. So, I know now that William and his immediate family left Georgia some time before 1832. I have also been very curious about where William Crittenden lived in Georgia. The property valuation states that his property was on Petit’s Mill Creek. This will be especially meaningful to me when I travel to Georgia, I hope in the next few years. Some of the valuations have foot notes about the property. I was lucky to find one for William’s property. I am not sure what “but tolerable” means, and it could well be an error in interpreting the handwritten notes from the original documents. I have other relatives listed in the emigration rolls. 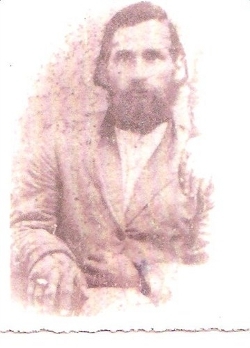 None in as direct a line to me as my great, great grandfather William. However, I will eventually incorporate the information for them into my family’s history. This is but one resource I found in my almost one month research trip to Oklahoma and Arkansas. As I make my way through my findings and organize them for entry into the family tree I will continue to share them with you. I hope that some of you will find the Cherokee Emigration Records a helpful resource in your documentation of your Cherokee roots and family. The United States agree to possess the Cherokees, and to guarantee it to them forever, and that guarantee is hereby solemnly pledged, of seven millions of acres of land, to be bounded as follows, viz: Commencing at that point on Arkansas River where the Eastern Choctaw boundary line strikes said River, and running thence with the Western line of Arkansas, as defined in the foregoing article, to the South-West corner of Missouri, and thence with the Western boundary line of Missouri till it crosses the waters of Neasho, generally called Grand River, thence due West to a point from which a due South course will strike the present North West corner of Arkansas Territory, thence continuing due South, on and with the present Western boundary line of the Territory to the main branch of Arkansas River, thence down said River to its junction with the Canadian River, and thence up and between the said Rivers Arkansas and Canadian, to a point at which a line running North and South from River to River, will give the aforesaid seven millions of acres. In addition to the seven millions of acres thus provided for, and bounded, the United States further guarantee to the Cherokee Nation a perpetual outlet, West, and a free and unmolested use of all the Country lying West of the Western boundary of the above described limits, and as far West as the sovereignty of the United States, and their right of soil extend. The United States agree to have the lines of the above cession run without delay, say not later than the first of October next, and to remove, immediately after the running of the Eastern line from the Arkansas River to the South-West corner of Missouri, all white persons from the West to the East of said line, and also all others, should there be any there, who may be unacceptable to the Cherokees, so that no obstacles arising out of the presence of a white population, or a population of any other sort, shall exist to annoy the Cherokees— and also to keep all such from the West of said line in future. Cherokee Emigration Records 1829-1835 – This book is a reprint of Senate Doc. #403, 24th Congress, 1st Session. It was compiled and indexed by Larry S. Watson with a 1990 copyright by HISTREE. It includes not only the valuation records of the land and improvements left in the east, but copies of the Treaty with the Cherokee 1817, Treaty with the Cherokee 1819, and Treaty with the Cherokee 1828. Reading the treaties helps to put the emigration records in context. I have not been able to find an ebook or a hard copy of this book available for sale online. It is available at several libraries. The Oklahoma Red Book Compiled by W. B. Richards, Corporation Record Clerk, Under the Supervision of Benjamin F. Harrison, Secretary of State, Oklahoma City, Oklahoma. This book covers much of the history of government history of public and private land in Oklahoma both before and after statehood. It can be downloaded from Amazon for Kindle for 99 cents. Treaty with the Western Cherokee, 1828, May 6, 1828. | 7 Stat., 311. | Proclamation, May 28, 1828. Yesterday was a memorable day on my family history trip. 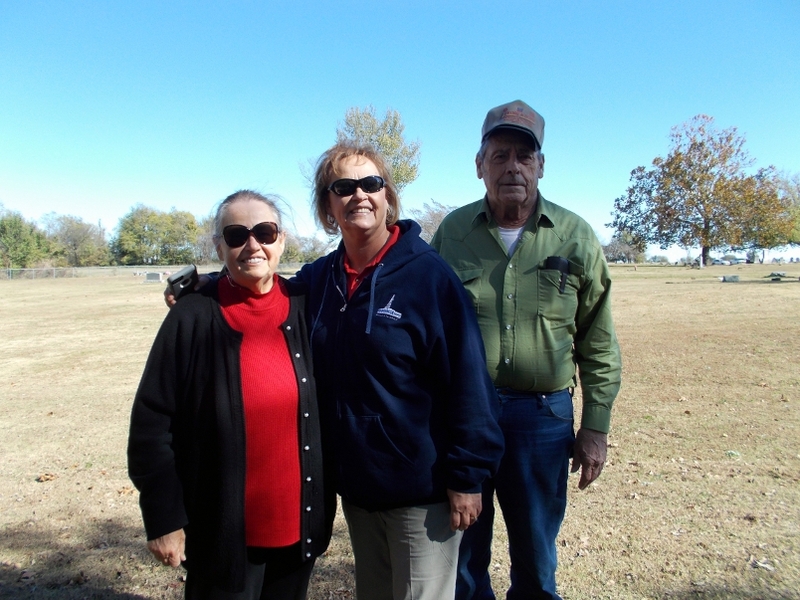 In Warner Oklahoma I met my second cousin, Bruce Crittenden, and his daughter Susie. Susie and I found each other online a couple of months ago when she wrote me a note after reading Cherokee Roots Blog. She introduced herself as Moses Crittenden’s great great granddaughter. As Moses was my great grandfather that meant that Susie’s father and I are second cousins. Moments after meeting Bruce yesterday I could feel my eyes welling up as I had just met my first descendant of Moses Crittenden and the first blood relative of my extremely large Cherokee family outside of my mother’s immediate family. This was the culmination of five years of research that started with a search for my grandmother’s Cherokee ancestors. I could have never guessed what an inspiring and surprising journey it would be. 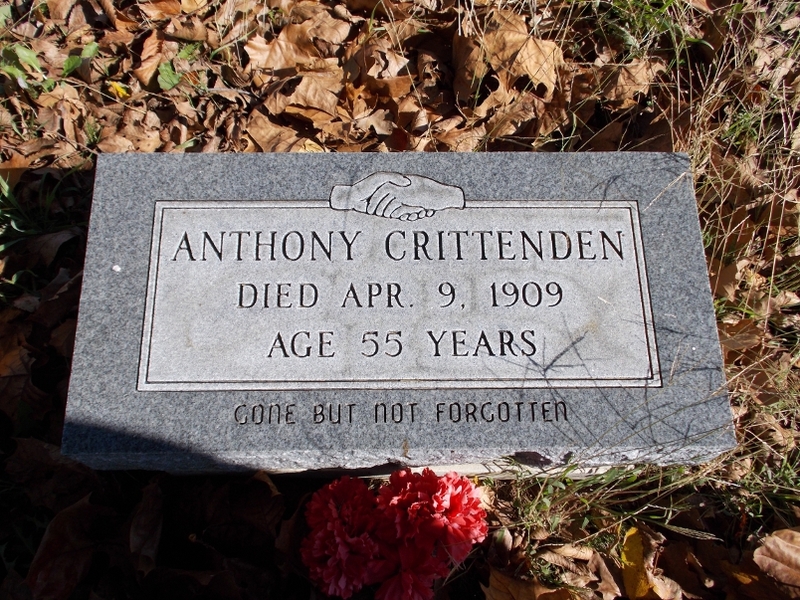 After almost four weeks on the road in Oklahoma and Arkansas I took some time to go to the cemetery where Anthony Crittenden, my grandmother’s half-brother is buried. Being there with his grandson and great granddaughter added special meaning to this moment. I will be sharing more memories and discoveries from this trip over the next few weeks. Tracing my Grandfather – Who was James R. West? I started this journey with very little information about my grandfather. From my mother’s birth certificate I had his name listed as Jas R West. I knew that he had lived in Oklahoma and Arkansas during the time that he was married to my grandmother. My mother remembered that he left the family when she was about two years old and that he came to visit her in Tulsa for one day when she was about nine years old. The only other piece of information that I had to go on was that my mother had found out that he died in 1951. My recollection was that he died in San Jose, California. My sister thought it was Montery, California. With only this information to go on I started doing research on ancestry.com. 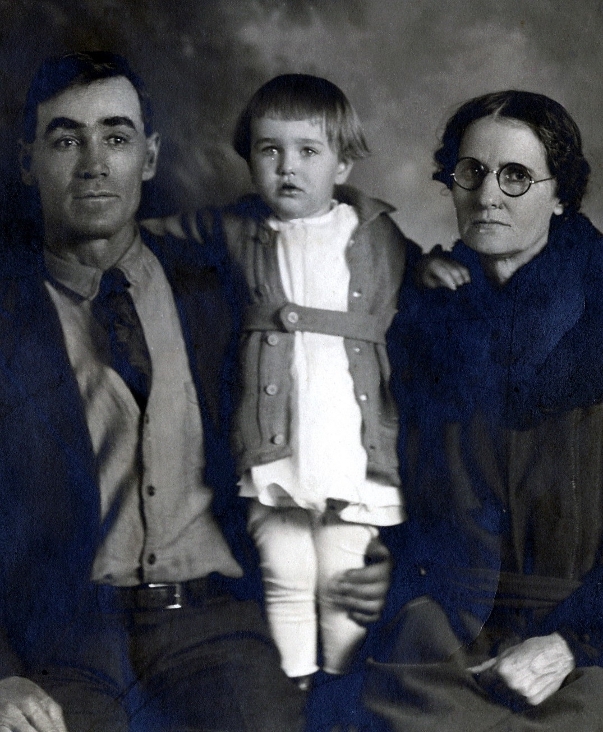 What I found was that there were many James Wests in Oklahoma and Arkansas during the years that my grandfather was with my grandmother, 1903 to 1922. A check of the 1920 census in Oklahoma showed my grandfather and grandmother and their four living children as being born in Oklahoma. It also stated that both my grandmother’s and grandfather’s parents were born in Oklahoma and that my grandfather was 44 years old. Searching with that criteria I could not find a James R West that matched. I decided next to search on FindaGrave for cemeteries in Monterey County. I found internment records for a James R West at Garden of Memories Memorial Park, Salinas, Monterey County, California, USA (I also found that John Steinbeck was buried in this same cemetery). Next I sent for a copy of the death certificate for that James West. The date of birth and death, plus location, made this seem like a match for my grandfather. However, the death certificate said he was born in Kentucky, while the 1920 census, one of the few records where I was sure I was looking at the correct James West, said he was born in Oklahoma. That same census also said that my grandmother’s mother and father were born in Oklahoma and I knew that was incorrect. It also said that three of my mother’s siblings, that I knew were born in New Mexico, were born in Oklahoma. I surmised that the census taker had just put Oklahoma as the place of birth in every birth place related spot for this family. So, I started looking for a James West born in Kentucky in 1875 whose father was named Dave West and whose mother’s first name was Sarah (information also on the death certificate). I searched and searched and found nothing that was a match. I then changed tactics and started looking in the 1890 census for any West families, in the county where my grandmother lived before her marriage to my grandfather, that showed a James West about 24 years old. I found a few, but none with a mother named Sarah and a father named Dave. I found none where James West was born in Kentucky. I did find a family. with a mother named Sarah and a father named Benjamin, where the eldest child was named David. On this census, James was born in Alabama but it was the correct year. I put this census in my records as a long shot possible match, but my best possibility so far. Fast forward several months when I have all of my relevant census data for 1900 printed out and sitting in front of me. Evidence that I had the correct family was sitting right in front of me. The census page for the family that I thought was a possible match for my grandfather in the 1890 census, no longer had the elder brother David on the census. However the family listed next to my grandmother’s family on her census page showed David West as the head of household. This David West was the correct age to be the elder brother of the Benjamin West household. David was now living in a separate household with a wife and children of his own. This made me study both census pages more closely and I realized that both of the census pages were from the same neighborhood. 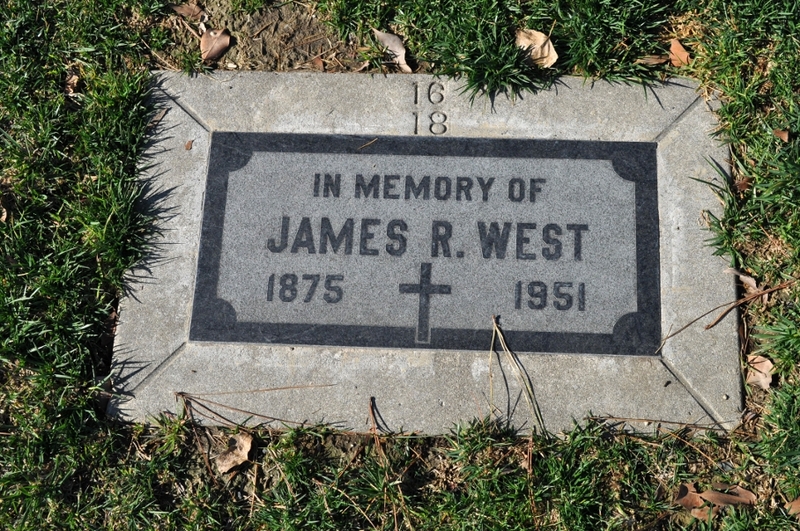 At last I was 90% certain that I was looking at the correct James West and had found my grandfather’s family. Now that I was on the right track, there were many discoveries over the next few months that confirmed beyond any doubt that this was the correct family. The big lesson learned here? 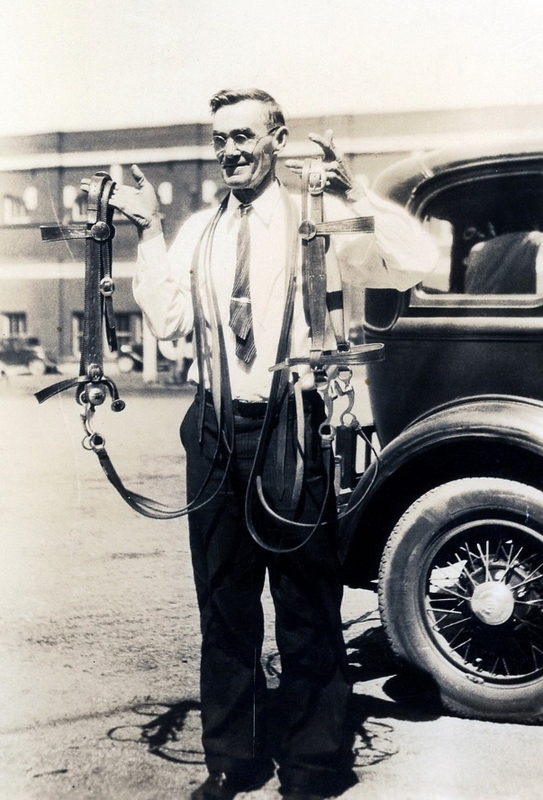 Those of us searching for our roots are always looking for the “official” documentation that proves the connections in our family tree. But the truth is, those official documents often have errors. In this case both the 1920 census and my grandfather’s death certificate had conflicting information about my grandfather and much of the information in both of them was incorrect. How does this happen? A tired census taker realizing the answer to most of the questions about place of birth for this family is Oklahoma, just writes that in every blank space. A woman, who has lived with someone for a few years and met when they were both in their 70s, provides the data for the death certificate to the best of her ability. An older brother gets listed as the father, a state that as near as I can tell this family never set foot in, is listed as the place of birth. Records are a valuable source of information. But don’t forget to look at the big picture. When you look at the families living next door to your ancestors on the census what does it tell you? Does looking at the census page before and after your family’s shed any light on the mystery you are trying to solve. Finding your family roots much more resembles solving a mystery than collecting data and organizing it. Good luck in continuing to solve the mysteries in your family trees.